Celebrated Indian author Arundhati Roy is in the country this week. 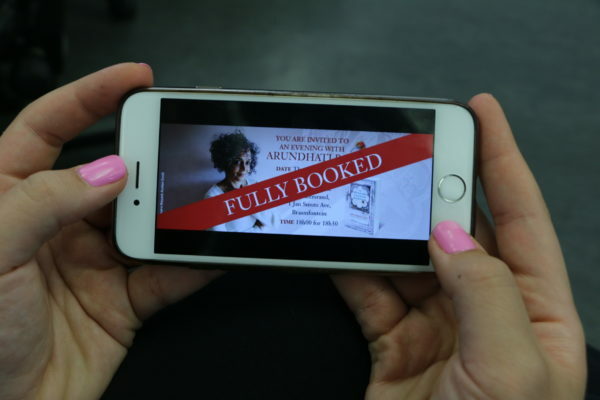 Book fans in Johannesburg were left disappointed by an event featuring renowned author Arundhati Roy organised by an international publishing house. Roy spoke at a gathering hosted by Penguin Random House South Africa in Fox Junction in the Johannesburg CBD on Thursday, August 16. The event, titled ‘An Evening with Arundhati Roy’, was criticised beforehand on social media for its organisation, which left many fans confused and disappointed. The event drew more criticism for the choice of moderator who was seen as ill-fitted to the occasion especially given Roy’s political work and writings. The literary event has been plagued by logistical issues. It was initially advertised by the publishing house through a Facebook event created created on July 16. The page advertised the event as free, provided an email address for RSVPs, and instructed those interested to respond by August 13 to secure a spot. Originally scheduled to take place at the Wits Club at Wits University, the venue was moved at late notice as a result of the overwhelming response. Ellen Van Schalkwyk, International Marketing & Publicity Manager for Penguin Random House SA, told Wits Vuvuzela that over 1300 people had RSVP’d within the first 24 hours. A number of fans wrote on social media that they failed to secure tickets and were not even given a response to their requests which were sent well before the deadline. Roy fan, fourth-year Wits Law student, Aaliya Ismail, says that she emailed Penguin Random House on July 17 and did not receive a response. When she tried to RSVP for a friend a week later, she received an automated response stating that the event was now fully booked. “I’m highly disappointed by the lack of response and communication and, as a result, I don’t know whether I have secured myself a place at the event,” she told Wits Vuvuzela shortly before the talk began. A week before the event, the Facebook event page stated that the engagement with Roy was fully booked, omitted the email address, and did not state where the new venue was. A group of fans took their frustration to Facebook. One of them, journalist and book lover Theresa Mallinson decided to start a read-in, which was scheduled take place just outside the venue. Mallinson said she had responded to the event invitation on July 18 and only received a response on August 2 indicating that she had been unsuccessful in securing a ticket. “I’m always going to literary events where there are complaints of a lack of reading culture in South Africa, but now they have an opportunity to showcase that there is a reading culture and they’re not taking advantage of it,” Mallinson told Wits Vuvuzela. Wits Vuvuzela asked Van Schalkwyk about this and she said, “We contacted a number of bigger venues that could accommodate a much larger crowd but unfortunately the space was not available on Thursday, 16 August. We debated whether to move the date of the event, but decided against it in the end. A date change would have impacted on Mrs Roy’s author tour schedule”. Despite the claims from Penguin Random House that the event was fully booked, about a quarter of the room was not full by the time the event began. Only half of the spacious Fox Junction venue had seating while the other half was reserved for food stalls and less than a handful of picnic tables and chairs. Even the people who attended Mallinson’s read-in were eventually allowed into the venue as there was enough space. Some attendees were also critical of the moderator, South African author Michelle Magwood, who was in conversation with Roy. During the question and answer round, one audience member pointed out that Magwood, who is white, is not representative of South Africa’s demographics. Twitter users were also upset by Magwood’s questions and her reference to South Africa as “the West”. Throughout the evening Roy discussed her novels, The God of Small Things (1997) and The Ministry of Utmost Happiness (2017) as well as her work on imperialism, the Indian caste system and her critiques of capitalism. She has also criticised the elite in India for replicating imperialism and for adopting capitalist policies which reversed gains that were made for the poor regarding access, education, and land ownership. “I see it unfolding before my eyes. You can see how corruption and injustice are being praised in the name of capitalism,” she said. Roy spent about two hours after the event signing books and chatting to those in attendance. FEATURED IMAGE: Indian author Arundhati Roy speaks at the literary event, ‘An Evening with Arundhati Roy’ on Thursday evening, August 16.